In this new edition, based on new research and double the survey data, ENGAGEMENT MAGIC provides you with an expert approach to increasing workplace engagement. Discover how to engage employees (and yourself) more effectively. Most leaders understand that engaged employees are passionate about their jobs and deliver better results, and most of us know what it’s like to either be engaged or disengaged in a workplace where we spend most of our waking hours. Yet, most don’t understand how engagement really works. 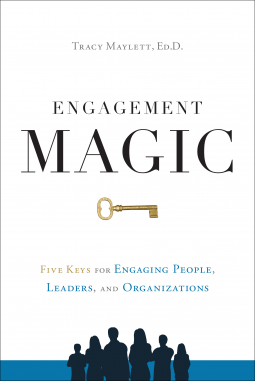 Maylett introduces you to the five MAGIC keys of employee engagement—Meaning, Autonomy, Growth, Impact, and Connection—and discusses how leaders can help employees achieve higher levels of engagement, while engaging ourselves in the journey as well. Learn tactics for increasing engagement at all levels of your organization. Based on the most extensive employee engagement survey database of its kind, ENGAGEMENT MAGIC incorporates organizational research with updated case studies, stories, and examples to present you with practical solutions for creating an extraordinary employee experience. In addition, Maylett provides a self-assessment, thought-provoking questions, and specific applications for individuals, managers, and organizations. Benefit from a psychological approach to fundamental business concepts. Based on data from over 32 million employee survey responses across 70 countries, ENGAGEMENT MAGIC combines principles of psychology and human motivation with solid business concepts, providing actionable advice for reducing attrition, encouraging initiative, and driving profitable growth at your organization. "Meaning, Autonomy, Growth, Impact, and Connection--five keys that can change both organizations and lives." "Most of us intuitively appreciate the power of engagement for personal and organizational success. ENGAGEMENT MAGIC does an exceptional job of turning appreciation into action. The formula captures the essence of engagement; the stories illustrate its use; and the questions and tools lead to sustained actions. This book on engagement is both engaging and useful." "The importance of creating and nurturing an engaging employee experience cannot be overemphasized for sustainable achievement, and it's also our responsibility to choose to be engaged. This book outlines five keys that we have embraced successfully at ATD to drive engagement, both organizationally and individually." "When leaders bring their hearts, spirits, minds, and hands to their work, they become powerful forces in leading successful teams. ENGAGEMENT MAGIC masterfully shows how each of us can work our own big of 'magic' in engaging people."